CMCI provides simple and agile Cloud Computing services and solutions that address Cloud migration, aggregation, sourcing, procurement, and governance. 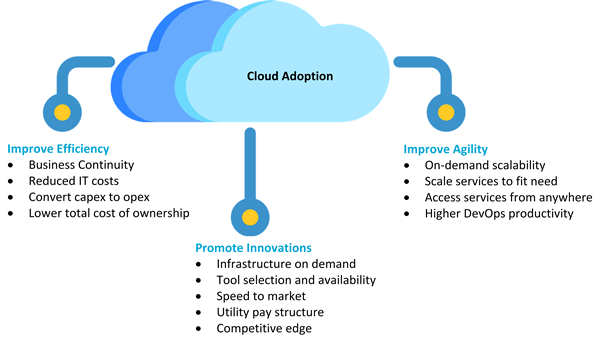 CMCI leverages its cloud expertise and methodology for each Cloud initiative to determine Cloud options including identifying applications to migrate to the Cloud; the cost and return on investment; and how to manage, regulate, and centralize control. CMCI’s vendor agnostic approach assesses each organizational Cloud need (public, private, or hybrid) according to platform, infrastructure and software requirements. Our tailored Cloud solutions ensure improved efficiency and agility as well promoting innovation upgrades and enhancements. We rapidly and efficiently build and deliver customized Cloud applications while providing a single point of accountability and control. CMCI’s Cloud Computing solutions and services reduce cost and improve system reliability.